The Water Butler® from Cheekita is an automatic self-refilling water bowl and represents a great alternative to traditional water bowls or expensive pet fountains. During Sydney’s hottest day and warmest year on record in 2013, devoted pet owners Samuel and Marisa were trying to think of innovative ways to keep their two dogs cool, comfortable and refreshed. Through a combination of research and numerous trials of their featured product, The Water Butler®, they knew they were onto a winner and wanted to share their unique, smart idea with fellow Australian pet lovers. It only takes a couple of minutes to connect to your outdoor tap and your pets will have unlimited access to a fresh supply of clean water. When connected to a garden tap, The Water Butler® will provide a constant automatic refill up to a third of the bowl height, keeping the water cool and fresh, minimising any potential danger of accidentally drowning puppies, kittens or other small animals. Watch the video below to see how easy it is to set up and use. **Please note that whilst The Water Butler holds 3-5 Litres, the float valve has been purposely enabled to deliver a low water level. Whilst it is perfect for medium to large dogs, pet owners of small dog breeds may experience some difficulty in their beloved pet reaching the lower water level. 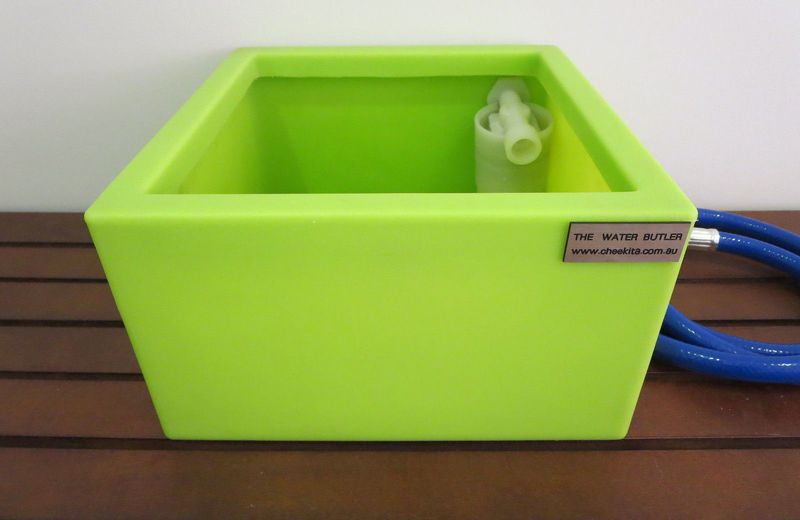 The Water Butler is made of durable, hard wearing PE plastic so it won't rust. Ours has been in continuous use for over 15 months and it has not aged at all. It sits on the deck where temperatures can reach well over 38 degrees in the shade in summer yet the material has held extremely well. We also love the generous size (26cm x 26cm x 15cm) which means our two Malinois can happily plunge their heads at the same time to have a long drink after a game of chase in the garden! This is a definite must-have item in our house during the summer months. Another plus is that it is very sturdy, even with three boisterous Belgian Shepherds, it has never been toppled over. Our personal recommendation is to disconnect it periodically if you notice that the bottom is getting a bit slimy. Simply scrub away any sediments at the bottom and after a quick rinse, it is ready to be used again. You can purchase a replacement float valve, water cube or hose (including fittings) from the manufacturer’s website however we have had no need to replace any parts so far. Available in White, Lime, Red, Terracotta and Slate to suit any décor. Disclaimer: This is not a paid or compensated review, but a review of a product that we purchased for our own use. We enjoy sharing information about products you may like or find useful and you’ll always receive our honest and unbiased opinion.